I found out sometime in November that I was 1 of 50 selected to attend GTA in Washington, DC in December. We would find out later that about 350 people applied. What followed was a flurry of posts to Twitter from myself and others all using the #gtadc tag and a majority of the group found each other before even setting foot in Washington, DC! We even planned a meet up at a local restaurant the night before GTA which was a nice lead-in to to the two days we would spend together. GTA was held at the Google offices in Washington, DC for a day and a half. When people ask me how it was and what did I learn, I can only answer as a fellow colleague Danny Silva at the academy answered, "It was like they turned on the fire hose of information and shot it at me and didn't let up." The sessions we attended were all great. I loved how we all had our laptops out and had multiple windows open to test what they were showing, take notes for later and share our knowledge on social networks. Part of this GTA that made it different from others was that the organizers allowed for a second "half" day that had no set agenda. Those that wanted could stay and as a group we would decide how they day would run. We had free run of the rooms at the Google offices for holding an in-depth training on a specific topic or tool or for networking with others. I personally did a little of both. Part of becoming a Google Certified Teacher is creating your action plan centered around how you will share what you learn from GTA with others. During some discussions with others, we came up with a project idea to create TechTrainingWheels.com Through discussions we found that we all felt frustrated with how we each individually ended up creating videos or documents in our own district and wanted to make a place where like-minded tech trainers could post these videos and documents to help with not only Google tools, but any type of technology training. More hands = Less work. Our motto is "we will help you take the training wheels off." We just recently got the site up and running so be sure to check it out and see how you can contribute or share. My time at GTA was great. I learned a lot and was challenged to keep up with the presenters which I personally like. I went in with the mindset for them to give me as much as they can while I'm here and they sure did. I also liked being challenged to share this with others. Since coming back, I have done two trainings in my school to share some of my knowledge. I also have been meeting with individuals or teams to show a tool that might make their lives easier. I presented at our state WEMTA conference on using Google Apps in the Classroom. I was asked after that to present at a local Discovery Education program and two other districts this summer during their respective summer academies. As for Google Apps, I signed up my district for but for now, it's me just learning the behind-the-scenes of it all. I'm struggling with how to open this up to others so it doesn't become a management headache for me. I also want to use with students so I have been reading up on other's challenges and pitfalls to know how to best move forward. My GTA time was very rewarding and I find that I am networking, learning and sharing more now than I was before attending GTA. The networking through our Google Certified Teacher Group has been invaluable. If you are interested in following any of the other GCT's from the DC group, this is the GTA Twitter List. If you want to keep on top of when the next GTA will be open, you can check the Google for Educators site and sign up there for their newsletter where they post such information. 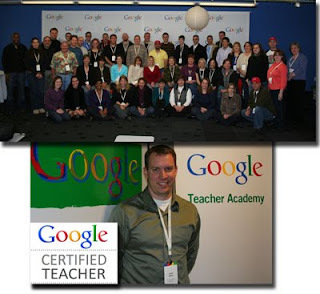 If you're curious, here is some information on what it means to be a Google Certified Teacher.